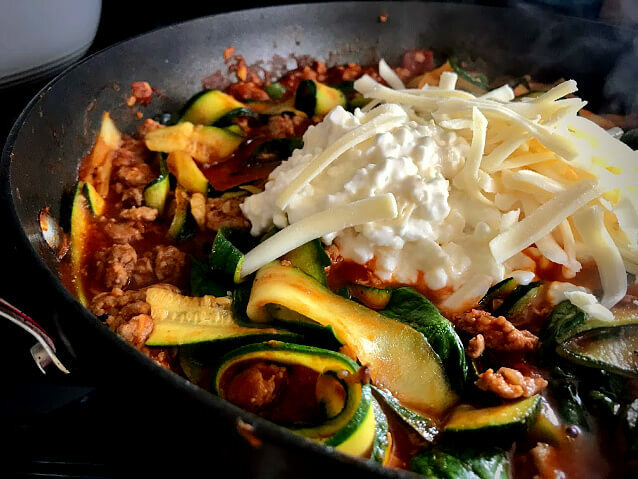 This Skillet Zucchini Lasagna is a delicious, healthy, lower carb alternative to classic lasagna. It’s easy to prepare, and full of lots of flavor- you won’t even miss those noodles! As much as your girl loves pasta, I know that from time to time, I need to balance it out with a healthier alternative. 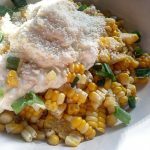 I believe that with portion control, anyone can enjoy pasta weekly, and still lose those pesky pounds while living your best healthy-ish lifestyle. So every once in a while I like to make zucchini lasagna, because it totally hits the spot! 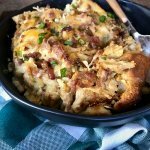 The last time, I decided I was just going to throw it all in a skillet, and see what happened. Why did I try it this way, you ask? Because I challenge myself at every opportunity, to keep my recipe-inventing game at Jedi Master level? Well, that all sounds real great, but I’ll be honest… all my casserole dishes were dirty, and I didn’t feel like cleaning them at the time. Hah! But you know what? That’s totally okay! 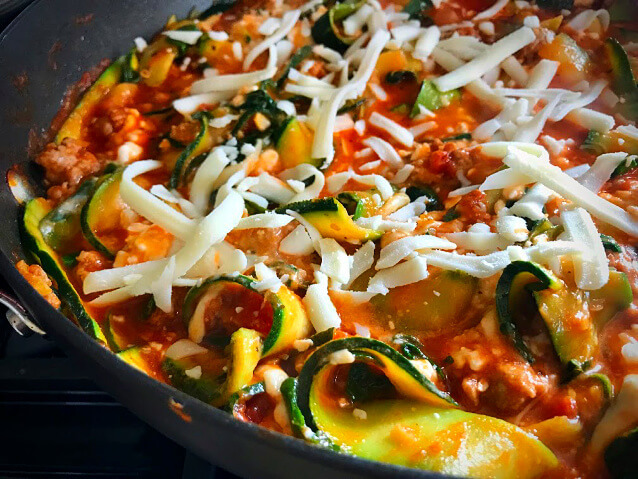 Because instead of cleaning dishes, this easy-peasy Skillet Zucchini Lasagna was born. It’s officially a thing in our house, and we love it! Even Eric truly enjoys this one. And lemme tell ya, he’s not the easiest to please when it comes to low carb alternatives. In my opinion, the most important thing to remember when you’re replacing noodles with a vegetable is to realize that it’s not going to be exactly the same. You’re not going to take a bite’a this and think, “Holy smokes! 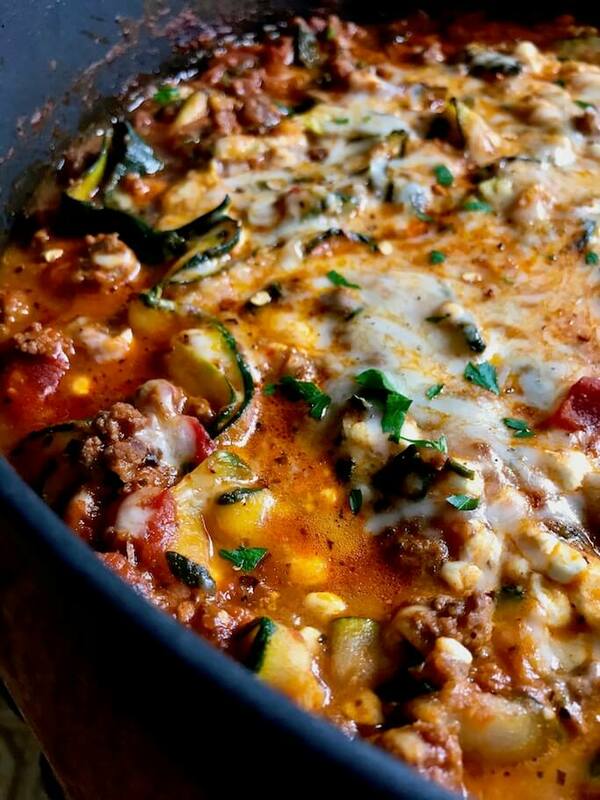 that tastes exactly like mom’s lasagna!” Yeah no… spoiler alert- it’s zucchini, friends. 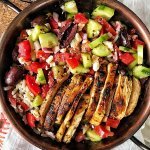 But I promise ya right now, if you think of this as exactly what it is- a delicious way to eat a low carb, veggie-filled dinner on a Thursday night, then you’re going to love it! 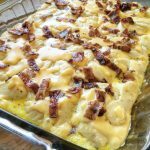 And oh yeah, I almost forgot the last great thing about this low carb lasagna. More cheese! The end. First things first- let’s make some zoodle noodles! I went for a lasagna-esque lookin’ noodle, but you could totally just make the noodles like spaghetti. 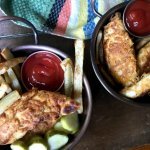 You can make these a few different ways, which is awesome! Vegetable Peeler. Just hold your zucchini at the stem, and slide the vegetable peeler down the sides. Pros– Easy, Quick, Nothing big to wash when it comes to dishes. Cons– It can get tricky when you have just a couple slices left to peel, which is a little annoying. Mandoline Slicer. 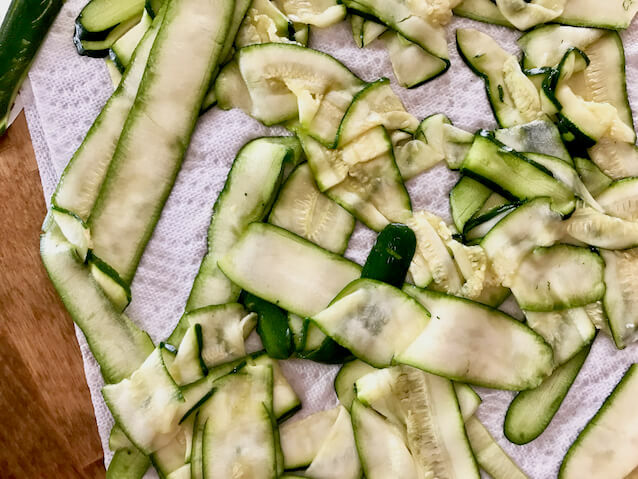 Pros– Super easy to just slide the zucchini and make thin slices. Cons– You could totally lose the tip of your finger. Kidding! …but not really. Friends, whenever you use a mandoline slicer, use that safety guard that most likely came with your mandolin. If you use the guard correctly, it’s literally impossible to cut yourself, okay? The one I’ve linked to above is the same one I own. It’s affordable, and it comes with a guard. Spiralizer. 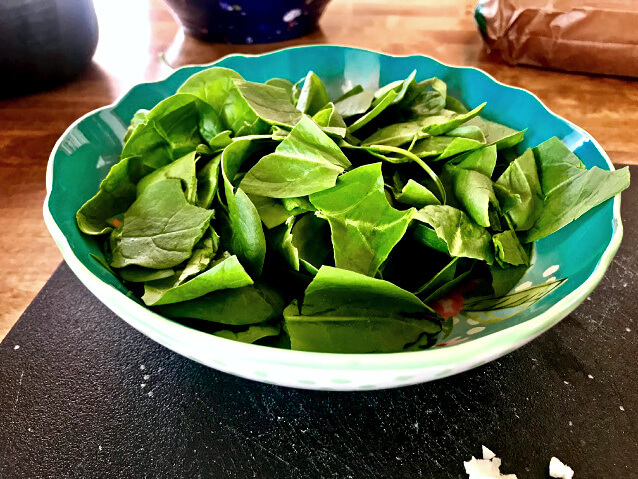 I have a love/hate relationship with spiralizers, but it’s only because I get a bit annoyed when it comes to extra bulky appliances (and extra dishes too). I really do love this lil’ piece of equipment! If I had a bigger kitchen, and someone to do all the dishes, I would use it more often. This gadget makes the quickest and best ribbon-style and spaghetti-style zucchini noodles. I really do recommend this… if you’ve got the room, and a full-time dishwasher. Jk! It’s really not all that hard to wash, I’m just all about simplicity in this season of life. Or… just stop by your grocer’s produce section and buy them already spiralized. Ha! Is it more expensive? Yup. Is it convenient? Yup. Does this make you any less of a cook? Absolutely not. Okay, so we’ve covered the “hows” and the “what you needs” to make the zoodles. Let’s talk about how those babies can hold quite bit of water! I actually sprinkle them with some kosher salt, toss them a bit in a colander, and then let’m hang out in the sink for about 10-15 minutes. The salt will draw out some of that excess water. Do you absolutely have to do this step? No. But since not all zucchinis are created equal, you might end up with one or two of’m that are holding a bunch of water… and nobody likes soupy, watery lasagna. So you’re gonna grab about 4-5 medium zucchini. Zucchini can vary quite a bit in size. (especially in the heart of summer around here- they are HUGE!) So the last couple times I made this, I weighed the zucchini noodles, and each time it came to 25-27 ounces. One more thing! You can do this part 2-3 days ahead of time. Just store’m in an airtight container with a paper towel folded in there to collect any excess moisture. And BONUS: if you do it a day or two ahead, this will truly be like a 10-minute dinner! 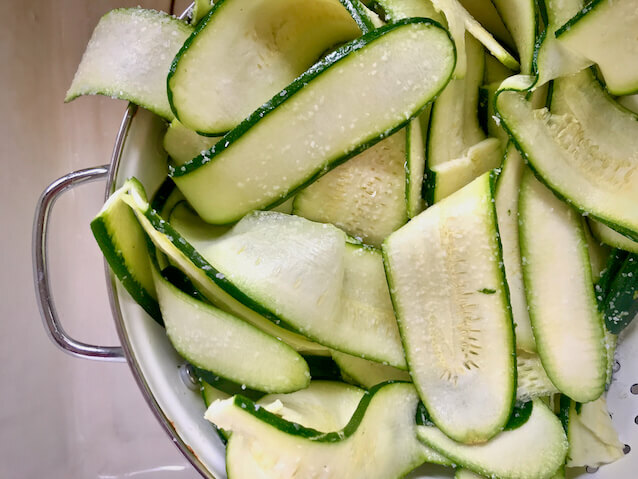 Now after you’ve noodled up your zucchini, whether you stick your noodles in a colander and draw the water out with salt or not, You need to dab them with a paper towel. I usually lay out the zoodles on a double layer of paper towels, then dab dry. Try to get as much moisture out as you can. After ya get all this done, you’re truly just minutes away from a delicious dinner! 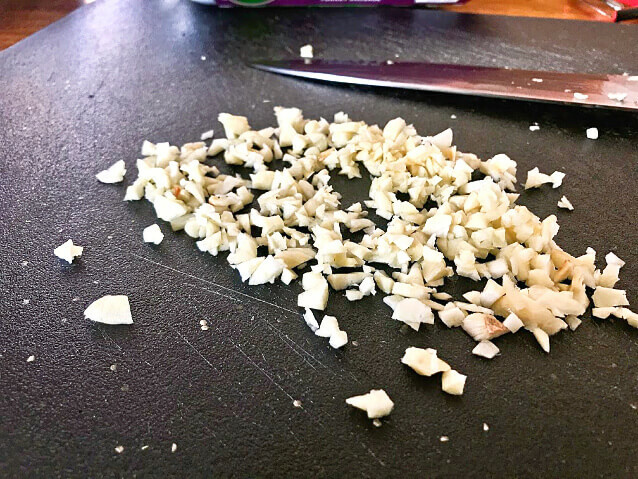 Mince up about 4 cloves of garlic. 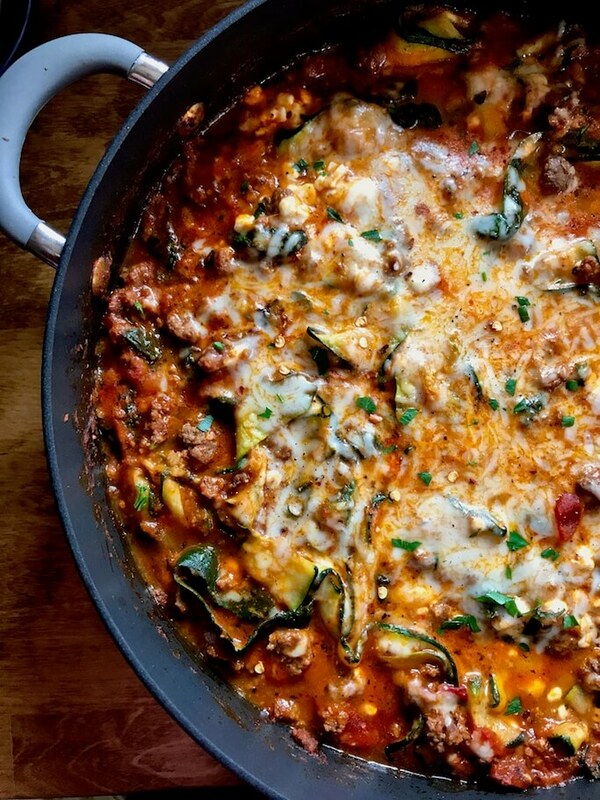 Grab a couple cups of spinach, because we’re gettin’ all sorts of healthy up in this lasagna today! I tear off the stems, but that’s just me. If you don’t mind’m, it’s all good- save yourself the extra step. (NOTE: See that paper bag in the upper right hand corner? That’s fresh bread… for the mouth-watering garlic bread to go with this low carb dish. Ha!! Grab a pound of Italian Turkey Sausage. If there’s casing on the sausage links, quickly remove it. 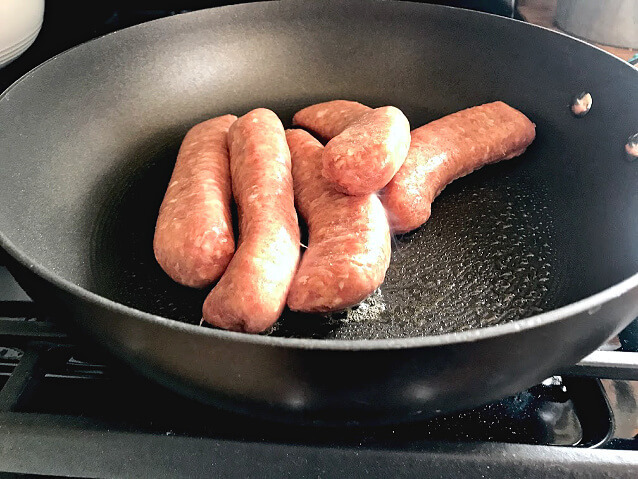 Toss the sausage into a hot skillet lightly sprayed with some olive oil cooking spray. Break it apart, while cooking with a spatula. Season with 1/4 tsp crushed red pepper flakes, salt and pepper. 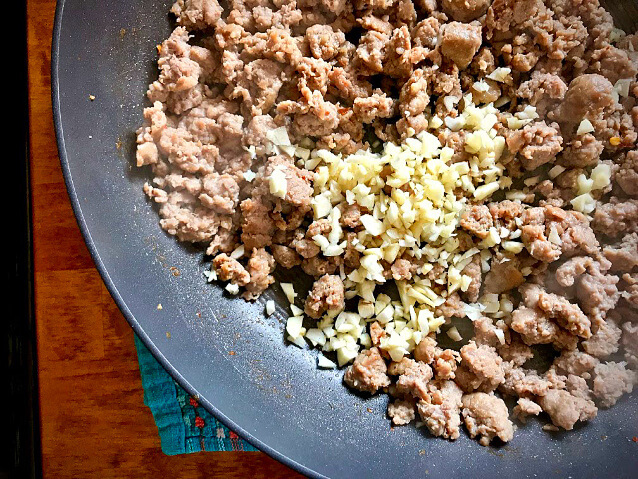 When the turkey sausage is cooked, throw in the minced garlic, and cook until fragrant (about 30 seconds). Now add two cups of marinara sauce! I’m using my favorite marinara, which just so happens to be my own recipe. 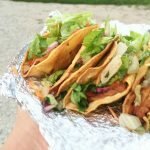 It’s versatile, easy to make, and freezer friendly! 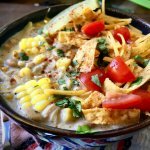 I posted the recipe for this about three years ago. To this day, it’s always in the top five recipes on the website. There’s no added sugar or oil, so it’s zero WW points & very low in calories. You can totally use your favorite store bought marinara, just be sure to adjust points/calories accordingly if you care about that sorta thing, alright? 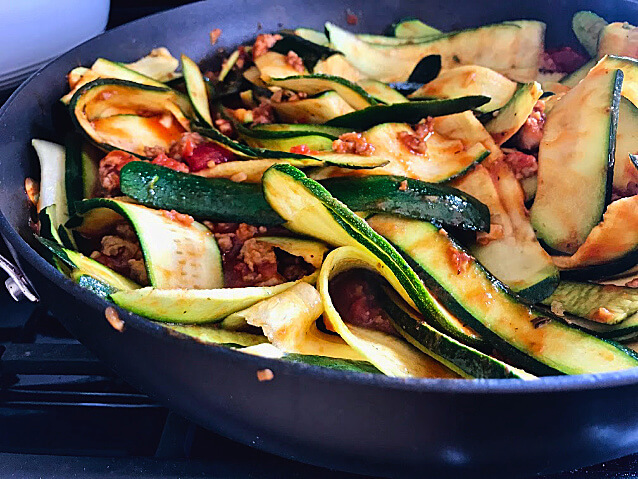 Stir in your zucchini zoodles, cover the pan, and let’m cook for about 2-3 minutes. Remove the lid, and stir the spinach into the zoodles and sauce. Cover again, and cook for another 3-4 minutes, until the zoodles are tender. Turn the heat off and stir in one cup of lowfat cottage cheese, and a half cup of shredded, part-skim Mozzarella. Top with the remaining Mozzarella cheese. Cover and let the cheese melt. Also, let this goodness just sit for about five minutes, to “set” just like real lasagna. You can do this while you’re slicin’ up that garlic bre… Uh, I mean gettin’ that salad chopped up!  Not judging here- whatever works for you in your world, baby. 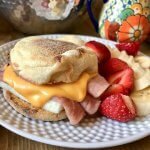 Ohh guys… it’s not carb-a-licious, but it’s sooo yummy! 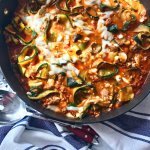 This Skillet Zucchini Lasagna reheats really well too! You can easily pop it in the microwave or the oven. You can even put it back in the skillet. It looks, tastes, and smells delicious enough to be a special Sunday dinner! 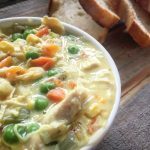 And it’s quick and easy enough for dinner on any night of the week. I hope you love this! Please comment below or on social media and let me know how it goes, y’all! 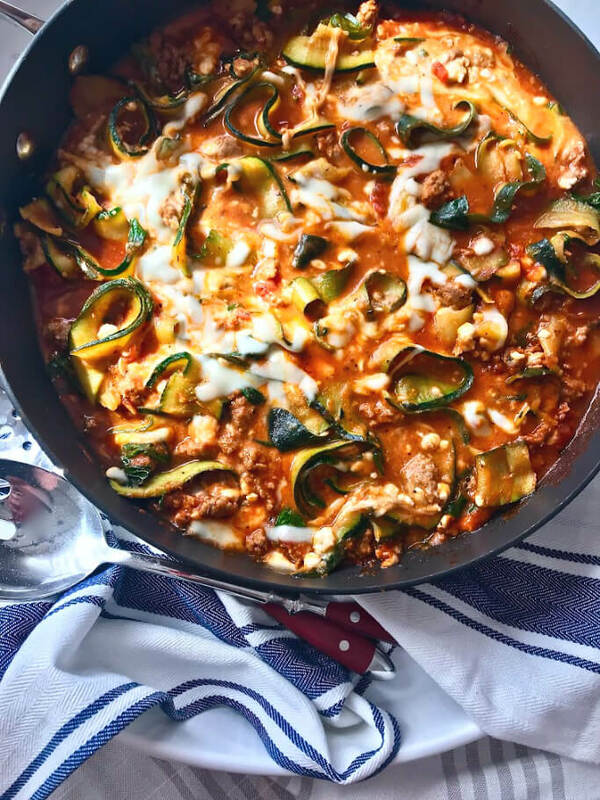 Skillet Zucchini Lasagna is a wonderfully easy and delicious low carb twist on classic lasagna! 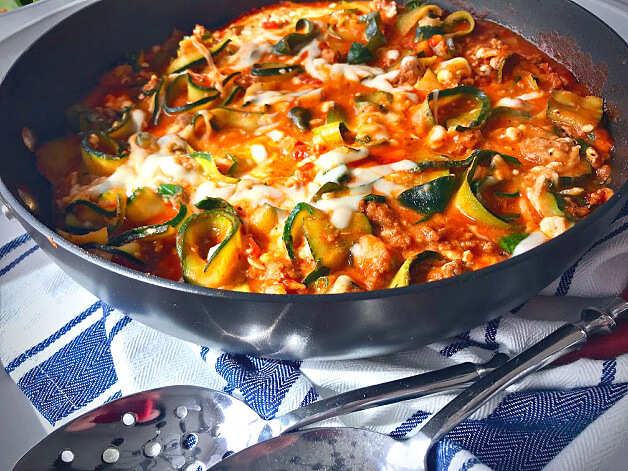 Made with zucchini noodles, spinach, lean Italian turkey sausage, homemade sauce, and cheese, it’s perfect for a weekday dinner, or any other time. After taking your first bite, you won’t even miss the noodles! Make zucchini noodles using vegetable peeler, mandoline slicer, or using the ribbon blade on a spiralizer. Pat dry very well with paper towels. See blog post if you need more information. Heat large non-stick skillet over medium heat and add Italian turkey sausage. Sprinkle 1/4 tsp crushed red pepper, salt, and pepper over the meat. Continue to cook and break apart with spatula and continue to cook until browned. Add minced garlic and sauté until fragrant (about 30 seconds). 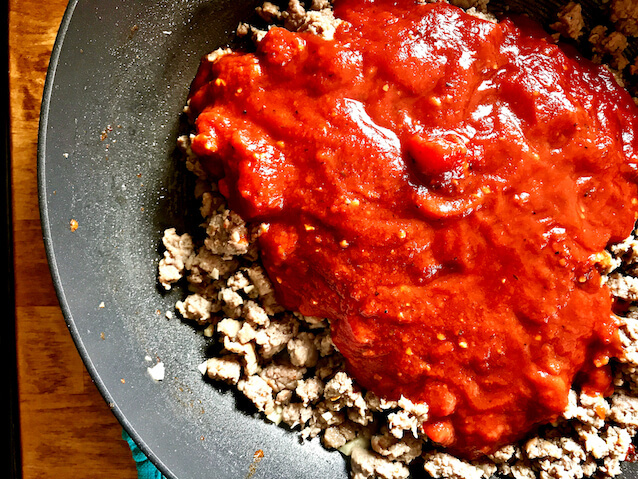 Stir the marinara in with the meat and cook for about a minute. 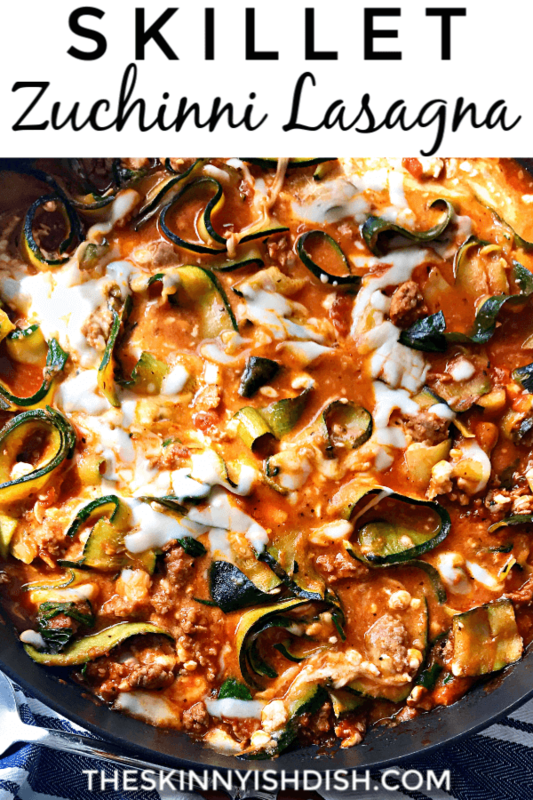 Add zoodles in cover the pan and cook for about 2-3 minutes. 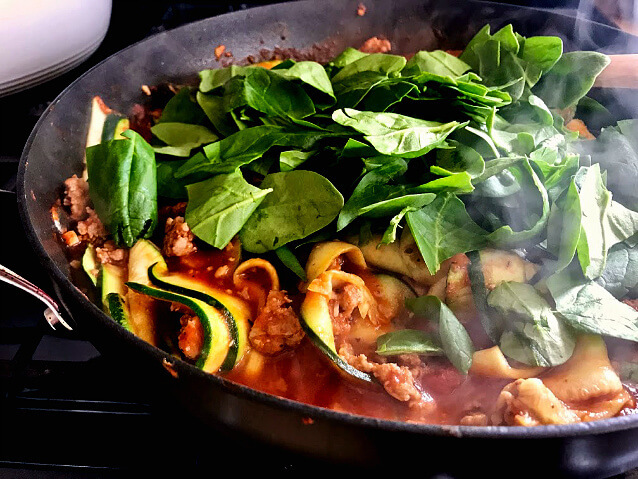 Remove lid, stir in spinach, cover again and continue cooking for another 3-4 minutes until zucchini is tender. Turn off the heat and stir in half of the mozzarella cheese and all of the cottage cheese. Salt and Pepper to taste and top with the remaining mozzarella cheese. Cover to let the mozzarella melt. Let sit for about 5-8 minutes to let it “set up” just like regular lasagna. Garnish with freshly chopped basil and Parmesan cheese if desired. 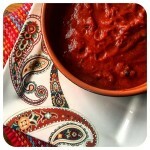 * If using your favorite jarred marinara sauce from the store or your own recipe for marinara. Please remember to adjust calories/points, if you care about that sorta thing. How would this be as a leftovers? I’m thinking about making it for my lunches for the week. Reheats great! Just had leftovers for dinner last night. I hope you enjoy!